How Do I Get Your Newborn to Sleep in a Crib? Newborn babies are an absolute joy. And while most newborns sleep about 14 to 18 hours every day, parents often face many challenges getting them to sleep. Though it's sometimes easy for a newborn baby to fall asleep in the your arms, the challenge comes when trying to put a baby in a crib to sleep. Because babies spend 9 months in their mother's womb, they much prefer falling asleep in cozy comfort. Getting a baby to sleep in a crib offers everyone a better night's sleep, making it easier to get through the day. With time and persistence, you can help your baby fall asleep in her own crib. Wait until your baby shows signs of readiness to sleep to put him in his crib. The Lucile Packard Children's Hospital at Stanford explains that if you put a baby to sleep in his crib when he is feeling active and playful, or not tired, this will only agitate him more. 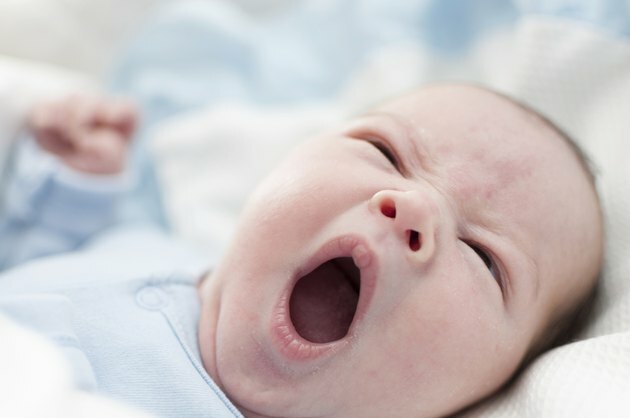 If you wait for signs of readiness to sleep, such as rubbing his eyes, yawning and drifting in and out of an early stage of sleep, it will be easier for the baby to fall asleep peacefully in his crib, because he is already tired. Put the crib in your bedroom so your newborn is aware of your presence. The scariest part of sleeping in a crib for a baby is usually not the crib itself; it is the fact that she doesn't know where her mom and dad are. If you put the baby's crib in your bedroom, she will be able to recognize that you are there with her at nighttime, and she will feel comforted, making it easier for her to fall asleep. Comfort him with soft music, darkness and mobiles. The Lucile Packard's Children's Hospital of Boston recommends against putting a stuffed animal in the baby's crib, however, as it could be a suffocation hazard. Go to her crib to check on her from time to time if she cries, comfort her in her crib and then go back to your own bed or your daily tasks so that she learns to fall asleep in the crib without you. Jodi Mindell, professor of psychology at Saint Joseph's University, tells the New York Times that parents need to be consistent in their behavior when getting a baby to fall asleep in her crib. She recommends checking on the baby and comforting her when she cries, but then walking away so that she eventually learns to fall asleep on her own. Although it may seem cruel to leave a crying baby alone for a period of time, this approach emphasizes that the baby will soon adapt and learn that crib time means it is time to sleep. The Lucile Packard Children’s Hospital at Stanford: Newborn-Sleep Patterns. The New York Times: For Getting Baby to Sleep, Sticking to a Plan Is What Counts.